Learn about panelized home construction and building the Barden way. The time has come: you’ve decided to embark on the journey to building a new home! Whether you’re downsizing or upgrading, making room for new family members, or looking for something that better suits your style -- this is an exciting new chapter. Once you decide to move, the options for your new home are seemingly limitless: renting, buying a home, stick building a home, modular building a home, panel building a home, and many more. But, once you decide a custom home is the right option for you, your options narrow down a bit and you are left with the choice of panel building, stick building, and certain types of modular building (depending on your customization considerations). Accommodation for accessibility concerns. When renting a home, or buying a previously constructed house it can be costly, and sometimes impossible,)to adapt this structure for accessibility needs. Unique architecture and design features. While renovations to previously existing homes are an option, for truly unique architecture and design tastes custom builds are the only way to go. Only panel building and stick building will give you endless customization options for aesthetics and build quality. Personalized quality control. If you’re purchasing a home that was built decades ago, it can be impossible to know if the original build was up to the quality you desire in terms of what materials, methods, and labor were used. Regional considerations are accounted for. When custom panel building a home, the engineering department can account for regional considerations such as snowfall amount to ensure performance and durability are optimized. Other factors, such as humidity, can affect the integrity of a home, and materials to optimize for this are accounted for as well. Ability to build on almost any lot. If you found your dream lot in a rural setting, it can be difficult to build without a team who can give you a custom floor plan and has experience developing in that area. It’s important to find an experienced team that is backed by a reputable company. In some rural areas, it can be hard to pull together suppliers and architects since they are so few and far between. A good panelized building company can help streamline logistics. If you’re investing the time and money into finding your dream home, why not make it exactly what you’re dreaming of? Custom home building is the best way to make sure all needs, considerations, and preferences are accounted for. As we outlined above, panelized construction is a popular option for custom home building due to the ability to truly make it custom while maintaining manufactured precision and quality control. Going beyond just what your home looks like, Barden panelized construction allows you to choose your building materials and choose your subcontractors and building team -- lending a fully customized and immersive home building experience. But just what is panelized construction? We always say that panelized construction is a hybrid of modular and stick building. Walls and roof trusses are assembled in the same factory conditions as a modular home, but are shipped to the job site in segments. Panelized manufacturers are all different. Some use the mass manufacturing benefits of the method to rapidly construct large track communities with limited customization options. Others build similar to modular builders; offering more customization and material selections while installing windows, siding, and insulation in the factory. 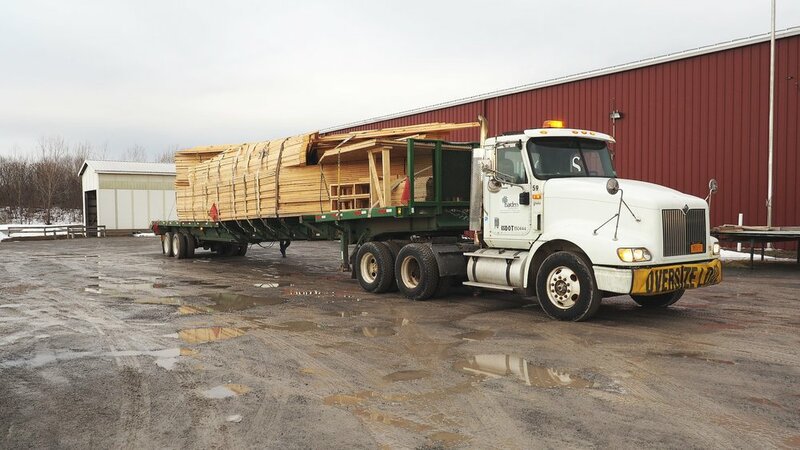 In our factory, we assemble all of the walls and roof trusses necessary to build a home, but not the siding and windows to avoid damage during shipping. We use high quality lumber and higher precision assembly methods than even the best stick builder. Our homes are assembled and enclosed quickly, minimizing exposure to the elements. Every home we manufacture is completely unique and customized to the customers specifications. Sourcing the lumber. At Barden Building Products, our lumber is brought in from Canada due to our proximity to where it is sourced. With the colder temperatures up North, the lumber grows more dense.We build mainly with Spruce Pine Fir lumber. Other species may be used depending on design requirements. Lumber is measured & cut. We use a computerized saw to measure and cut the exact length needed for the wall panels. This ensures no gaps later on. Additionally, lumber is protected indoors and sized per project -- eliminating waste and protecting material quality. Components are layed out & built. We use a precision IBS table to ensure exact dimensions and placement. Sheathing table. The sheathing is applied to the exterior panels with a staple gun and a router mounted on an IBS bridge extends over the panel and the router drops down into the window or door opening and travels around the edge of the opening to complete the window or door cut out. The sheathing material is customizable. Stapling bridge. During machine stapling each stud is secured to the sheathing. Panels up to 12 feet in height can be stapled all at once with the bridge with the staples being evenly placed. Walls are prepared for shipping. Once completed, the panels are secured and ready for shipment. Each truck driver is equipped with a set of building plans that has all of the panel numbers on it, allowing the building process to be as seamless as a 3D puzzle. Truss manufacturing begins. Before beginning, the truss designer has examined the building plans utilizing the Mitek E-frame engineering program to determine load bearing points and lumber and truss plate requirements. He then creates all of the shop cutting and manufacturing paperwork. The truss lumber is cut. Our saw is capable of performing 5 cuts at the same time on a board as the lumber passes through the saw, and can achieve angles that are otherwise difficult. This allows for a uniform final cut, and eliminates gaps or imperfections. Webs & cords are layed out. The components are then transferred to a Mitek Truss table for set up and assembly. The table is 120 feet long and 13 feet wide to accommodate projects of all sizes. Projects with truss dimension requirements exceeding the table size are accomplished in smaller pieces, and assembled in the field. Truss plate installation. A Mitek truss plate is applied to the top and underside of each connection point of the truss and lightly secured into place. Then a Mitek Roof Tracker gantry press travels over the table top to secure the truss plates partially into the wood. The truss then is transferred from the table to a roller system that takes the truss to the Mitek final roller press where the truss goes through the press completing the final plate application. Ready for shipping. The final manufactured trusses are then marked with the truss number on each of them to indicate their location in the building. Once loaded on the trailer, they are ready for on-site installation. For an even more in depth look behind the scenes of panelized home construction, check out our blog post guide. Modular building and panel building are often confused for being the same. Though the two methods are similar, there are some distinct differences in how the homes are built, as well as the final results produced. Modular homes are fully constructed in a factory, all interior and exterior features included. They are then shipped to the building lot on a trailer, and placed on a waiting foundation. These homes come in a wide range of quality; from the traditional small trailer all the way to 3500 sq ft homes shipped in several segments. Depending on the manufacturer, the homes can be built to flimsy code minimums, or engineered to the high standards of a luxury builder. Modular homes benefit from speedy construction times, a single point of contact for the customer, and choice of lot. From the outside, sometimes it’s hard to tell the difference between a modular and panel built home. Many of the considerations for why a homeowner would choose one method over the other have to do with the process involved in creating the home. There are downsides to modular when compared to panel construction. Although it’s true that modular building allows for customization, it is limited to the selections provided by the manufacturer and design is constrained by what can be engineered to fit on a trailer for shipment. Fixtures installed at the factory and structural integrity can be damaged during shipping. It is also common for the rapid construction to be delayed by the crews required to do the finishing work on the home, negating the benefit of speedy assembly. Though in both the case of stick building and panel building the home is assembled on site, there are some vast differences in the steps taken before the final home is completed on the site. In 2019, stick framing or stick building is still the most common method of building houses. The term “stick” refers to the lumber that is delivered to the site and is then used to construct the home. Stick framed homes are built entirely on-site. Raw materials are delivered, cut to size, assembled and installed right on location. Stick framing offers a large flexibility of design and materials selections. There are a lot of flaws to this method to go along with the benefits. Fit and finish are left entirely to the skill and care of the building crew. Raw materials are left exposed to the elements until they are assembled. The process is slower than other methods, which means your new home is sitting unenclosed and unfinished exposed to the elements, all while additional construction times rack up interest on your construction loan. Drafting and design of these homes can be done by either an architect, a $5,000 -$10,000 upfront cost for the customer, or offered by the builder. Choosing the right designer here can make or break the entire project. The smallest oversight of engineering details can result in drywall cracking, floor bounce or other structural issues. A construction loan is a short term, higher interest loan given to pay for construction. Funds are released in chunks, called draws, upon completing construction milestones. There can be anywhere from 2 to 10 draws in a construction loan. A loan structured with fewer draws may leave you responsible to pay contractors up front until the required milestone is met to release the next draw. Working with the right lender is key! Barden’s homes can be built very quickly compared to traditional building. This can lead to less time accruing high construction loan interest! After financing is finalized, there are 6 steps to creating a Barden Home. At Barden, we pride ourselves on being a single point of contact for homeowners to coordinate their building efforts. This is why even though we primarily handle the manufacturing of walls and trusses for the home, our work with the customer starts in the design phase. Our in-house design team that works closely with the new homeowner, and their building team, to craft the perfect home. Every aspect of the home is pored over and considered -- from the internal design color scheme to the type of lumber used for construction. We uniquely allow our customers the freedom to purchase and select their own materials if our selections aren’t to their tastes -- allowing them to design their homes with absolutely no limitations. Tom G. Head of engineering and production design. After the design phase is complete, the home plan drafts are passed along to our in-house engineering department. Our expert staff carefully ensures that all the selected materials are perfectly suited to handle their intended purpose for the home. Factors such as building codes, safety regulations, and efficiency standards are taken into account as well. When applicable, our engineering team accounts for regional concerns -- such as load bearing for average area snowfall amount, or windows that offer greater resistance to high winds and drafts. After the final engineered home plan is complete, it is digitally rendered utilizing our Mitek E-frame engineering program, which helps determine load bearing points, and lumber / truss plate requirements during manufacturing. It essentially offers a 3D puzzle model for the manufacturing team to work off of while on the floor. Once the plans are finalized with engineering, manufacturing can begin work producing the components for the home. Everyone on the floor is following the digital design plan for the home, which ensures precision during every step of the manufacturing process. This technology greatly reduces the chance of human error, since each step is performed by highly skilled workers who are guided by precision technology. Additionally, due to the materials being stored and assembled in a factory setting, the integrity and quality of building materials is maintained without the risk of weather degrading them. For a full look at our manufacturing process, check out our Behind the Scenes of Panelized Construction post. We have a fleet of trucks that are equipped to ship all of the components needed for your home build to the site safely and securely. Each truck driver is equipped with a set of the building plans to correspond with the components that they are transporting. Once they arrive, they are passed to the foreman of the building crew, who can unload and begin assembly. Since each component is labeled in accordance with the engineering plan, builders can quickly assemble the pieces together accurately. Again, this step is similar to building a giant 3D puzzle. After the walls and trusses are put into place, the interior building can begin. The home is assembled in accordance with the plan agreed upon by the team during the design phase. We have a fleet of X trucks that are equipped to ship all of the components needed for your home build to the site safely and securely. In order to create your dream custom home, our in-house departments coordinate with other area specialists to build a team of experts. We handle the coordination of and communication with the different team members, enabling a single point of contact throughout your building experience. As we talked about a little earlier in this guide, our team is responsible for designing and engineering the home, manufacturing the framing, and supplying all of the other materials to finish the home. There are some materials that we do not supply. This is largely in scenarios where we cannot compete with local speed and service on a large scale, and helps us keep costs down for our customers. This does NOT mean that our customers are left to source these materials on their own. Our dealers have trusted subcontractors to recommend / enlist for these jobs. However, the customer may find and choose their own if they have preferred vendors that they would like to work on the project. It is also important to note that Barden Building Products does not supply or assist with appliances, landscaping, fencing, or interior design either. Additionally, we have an in-house field manager on our team. He is available to advise any construction crews having difficulty with our products or any part of the construction process, but is not directly involved in the building process. Depending on the project needs, he may interact directly with customers. It is important to note, however, that he is not their general contractor, nor is he paid by the customer. He is involved to ensure that all of our customers’ homes are built to the same standard we have for our own work, like a quality control officer in the field. Our regional sales managers are responsible for ensuring dealers accountable and informed throughout every project, and are always available to answer customer questions. The Barden team provides support for our dealers to ensure their projects run smoothly. A prototypical Barden Dealer functions as a team of a salesman and construction expert. The salesperson works with the customer to design their home according to their budget. The salesperson will then formulate a budget according to the home plan and their knowledge of local subcontractor costs. Dealers that structure their clients as their own GC take full advantage of the Barden product. They have a full list of trusted recommended subcontractors for your project, but allow the customer to select their own. They will provide full project management assistance, but leave payment distribution to the customer. This may seem like a massive undertaking for someone with no construction experience, however, with the dealer’s experienced guidance this extra level of control can be a massive advantage and cost savings. The dealer will set allowances for each segment of the project that the customer can spend on their chosen subcontractors. These dealers have a list of recommended, reliable subcontractors that customers often choose, but are also free to select their own. The dealer’s construction expert/project coordinator then does all the work that a general contractor would do except for carrying the licenses/insurance, handling and distributing payments. It can also be noted that for an additional cost a customer may choose to hire a general contractor to handle everything for them, but these dealers are experts in guiding their clients through the process without a GC. A general contractor is someone who oversees a construction project and distributes payments to subcontractors. Depending on the Barden Independent Dealer you are working with, they may act as the general contractor, or you the customer will be your own GC with your dealer’s project management assistance. Our dealers that act as their own GC deliver turn key homes using their own trusted subcontractors with constant customer contact. Subcontractors are specialists that complete specific parts of your new home’s construction. Framers, roofers, masons, plumbers, excavators, and electricians are all subcontractors needed to build a home. Whether working with your dealer’s recommendations, selecting your own, or taking on these jobs yourself, you are in full control of this aspect of your project. Ready to Get Started Building Your Custom Home? If you think you might be interested in the panel building process, but have a few more questions before you get started, feel free to fill out this form and our team will be in touch to help answer your questions. If you’re ready to embark on the journey of partnering with Barden Building Products, please fill out this form! We’ll be in touch quickly with next steps for beginning work on your dream home. Not Quite Ready, But Want to Take This Guide With You? Simply fill out the form below, and a PDF version of this guide will be sent to your inbox for you to read whenever is most convenient for you!